Fun. Flirty. And a Wee Bit Dirty. Maybe you’re 9, and it’s the song they always played at the roller rink. Maybe you’re 13, lying on your bed and staring at the posters on your wall as you listen to the first album you ever bought with your own money. Maybe you’re 16, and it’s the song you always cranked in your car that first summer you could drive. It could be a big moment like the first dance at your wedding, or a small, seemingly insignificant one, like the song that was always on rotation during your shift at the mall – but whatever it is, you hear that song and you are transported back through time and space, suspended for a few beats in the version of the you that once was. A song that’s like that for me is CRAZY by Patsy Cline. 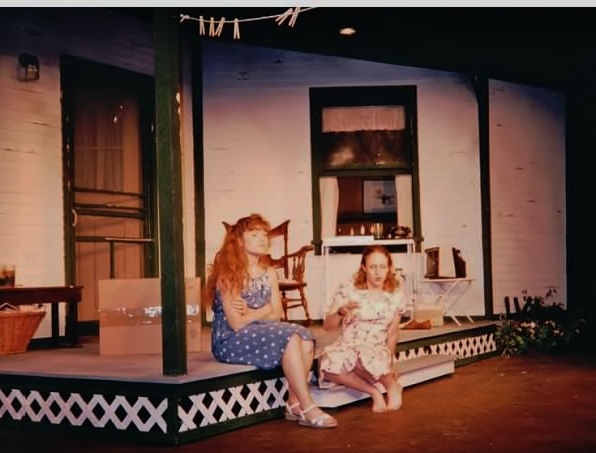 It was the summer of 1996 (I think, maybe it was ’95) and I was in a college production of Jame’s McLure’s Laundry & Bourbon, playing the role of Elizabeth Caulder. Every night before the show began I would wait alone backstage – in costume but not yet in character. Then the lights would dim, the audience would quiet, and the first notes of twinkling piano and twanging guitar filled the auditorium. When Patsy began to sing I would walk onstage. 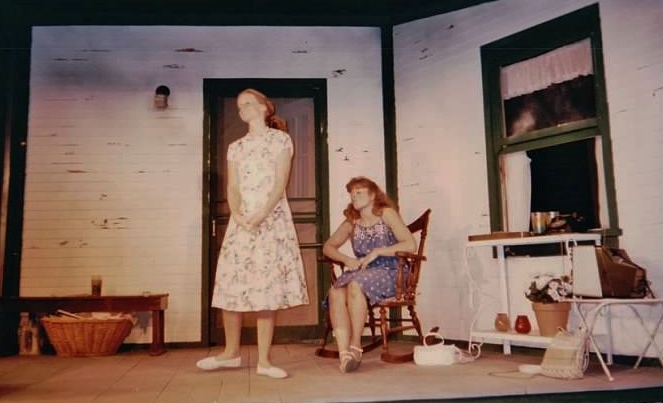 As I moved to my place in the hushed dark I transitioned from me to her, from Melonie to Elizabeth, from college girl to lonely housewife. By the time the lights came up and the music faded away, the transition was complete. I was Elizabeth Caulder taking laundry off the line in her yard on a hot Texas afternoon. 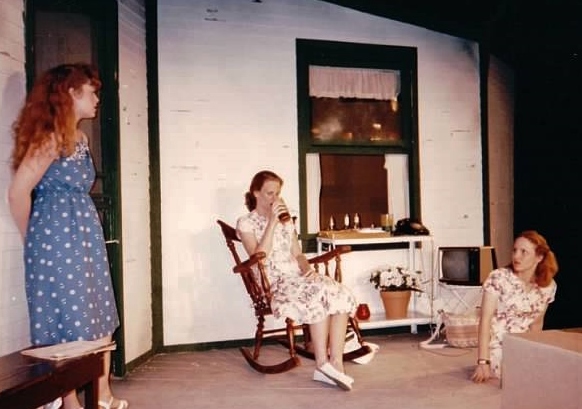 Elizabeth and Hattie, gossiping on the front porch. Look up and you’ll see the laundry line! Elizabeth enduring a visit from the sanctimonious Amy Lee. (played by my future IRL roommate). 20 or so years later (God, did I really just type that) I still can’t hear this song without thinking of that summer, of that show. It doesn’t mater if I’m in the car or a grocery store line, I hear those tinkling piano notes and Patsy’s voice and I’m backstage, waiting in the dark for my cue. Ready to take my place on stage, the sensation so strong I can almost feel the bright, hot lights on my face. They say smell is the strongest trigger for memories, and maybe that’s true, but nothing transports me back as completely to a specific place, to a singular moment, like a song. Have a song with the same time traveling magic for you? Hop on over to my FB Page and let me know! Follow Me on Book Bub!